While the iPhone got its first screen recording app back in early 2010, Android is only getting a proper screen recording solution today. Well, it’s better late than never, as the screen recording app released today does a whole lot more than simple screen recording: it’s called ScreenCast & Screen Recorder and, well, it lets you record your phone’s screen and take screenshots. 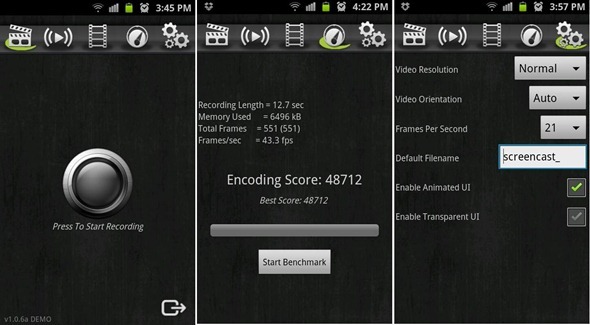 Screencast records your phone screen at high frame rates into a high quality MPEG4 video. This program includes a gallery to view, play, rename, delete and share your previously recorded videos from within the same user interface. Screenshot and live streaming are under development and will be appearing soon. Screencast requires a ***ROOTED*** device to operate properly. Click here to root your phone if your phone not rooted yet. We’ve personally tested the app on our rooted Samsung Galaxy Wonder GT-I8150 and can confirm that it works as advertised. We strongly recommend this app. Hunter can u help me up? I was unable to sent or receive mms, when i receive mms eg:a picture, it says downloading but cant be seen or open. Is there any other way or better messaging service for this phone? To receive mms, you need to enable packet data. Go to setting > wireless and network > mobile network > and tick enable packet data. But it is not recommended for prepaid user because it can reduce your phone credit to 0 instantly. To avoid this from happening, i suggest u subscribe to monthly data plan or use postpaid. You can also use DROIDWALL to blacklist all application using internet and only whitelist messaging app for receive mms. So, u only use packet data(internet) for messaging app only. But if u are a prepaid user and only want to use messaging app to receive mms, u need to install Droidwall first, then TICK messaging app ONLY in Droidwall before tick enable packet data in setting. Fantastic, you're such a genius xD Thanks a million man! How come that my ram is just 351mb only? Besides, there's lots of autorun or background applications running which makes my phone ram almost fully utilize all the time. I even try to use go power master apps, advance task killer, and also clear it manually with task manager but after few seconds it still re-run again. About the ram, is there anyway to solve it or should i go to the shop and ask them to change 1 to 1 for me? About the ram is just 351mb only, it is because the system uses memory to load OS and for graphics. In another word, the system has "eaten" some of it. not at all.. im totally busy lately, so, dont have time to reply to ur comment and update new post.. sorry for the late reply..
Deodexing? Fundamental and How to.